I'm new to the forum, but not to tuning. Over the years I have owned a pretty wild 1995 Eclipse GSX running DSMLink / ECULink pretty much from the beginning, multiple BMWs running JB4, and a few GMs running HPTuners. Now I'm trying to get my Polaris RZR up and running with the ViPEC. Background: I bought a wrecked Wasteland RZR to swap the drivetrain into my 800 RZR-S. The wrecked one I bought has a Weber 750 turbo motor. The previous owner had bought the ViPEC V44 with a custom tune from Queen Racing, but wrecked the buggy before getting it installed. Due to life, everything has been sitting in the corner of my shop for 4 years. Now I finally have time to work on it. Here is my dilemma, I am a complete newb to the ViPEC and I know there have been a lot of firmware updates over the years that my unit has been sitting. I don't even know what version mine was programmed with. Furthermore, there is one wire in the harness that I can't figure out. 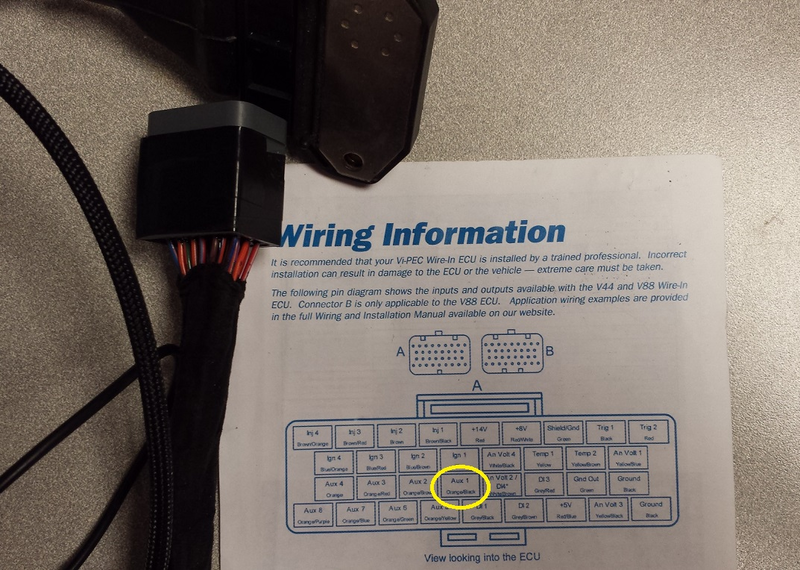 According to the manual w/ the ecu, it is AUX 1. I am hoping to power up the ecu on the bench, create a backup of the tune, and find out what this wire should go to. Can someone hold my hand on this and give me some direction as to how I should proceed? Firmware wise just grab the latest VTS (4.10.2) off the vipec site ant then once you have the unit powered up you can install the matching latest firmware. 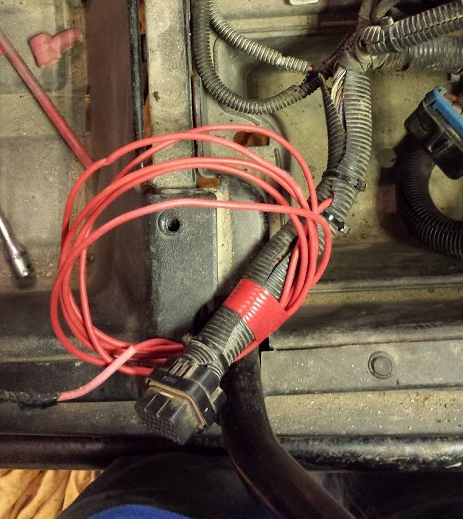 Is it a wire in V44 or the plugin dedicated RZR unit if not sure a picture will tell us. Thank you for the response. I'm sorry it took me so long to get back. I work a lot and don't get much free time on the computer. Here is a picture of the wire in question. Given the characteristics of the wire, I would expect it to be some kind of 12V power, but since I did not splice it in I can't make any assumptions. I'm also including where the wire corresponds to the V44. When I update the firmware, are there any things that I need to pay attention to that might get changed in the update? Things like preferences, settings, etc. Also, can I just update to the latest without going through each revision? The best way to get some clues for what Aux 1 was connected to will be to look at the map. I would not do a firmware update yet as if that is on really old firmware (prior to 4.4), you will have lots of settings to fix after the update. You should still use the latest VTS (V4.10.2) to connect to the ECU and save the map out of it. To power up you just need ground on pin 34 and +12V on pin 5. Connect to VTS (green online indicator at top right of screen), then go >file>save as. I downloaded V4.10.2 on 2 different computers and I can't get it to connect. First I installed it on an older laptop running Windows Vista that I use for tuning. Every time I plugged the usb cable in I got a driver error. I finally gave up on that and loaded it on my desktop running Windows 10. But when I try to connect to it all I get is "unable to connect". Any advice? First step will be to check in windows device manager to see if you have the ECU showing and if the drivers have installed correctly. I finally got the ecu to connect and was able to save the current settings! Hopefully I'm in business. I've attached a file. Now, is there a way to tell what the Aux 1 is supposed to be connected to? Also, how do I log the settings I will need to set up when I upgrade the firmware? On that map Aux 1 is set up as Idle speed control solenoid. The frequency is rather low however for this task. When you run the update it will automatically bring up the notes on this and ask that you read them. Thank you for the quick response. I will update this as I make progress. Old thread revival. I recently installed VTS V4.8.82.1129 (8-12-11) on my laptop. I saved the startup/base map that was created from it. From what I have read I can download VTS V4.10.2.1784 (24-06-14) and I will need to incrementally update the firmware. Is that correct or do i just update the firmware directly to newest version. I know there is an emphasis on reading the release notes but would a startup/base MAP be affected from the updates. Will updating to 4.10.2 give me the release notes to all the previous versions? I searched the web site and forum but did not see a section with all the release notes. Would be nice not to have to download the software to see them. If you are going to be tuning after the firmware upgrade then there is probably no need to know what has changed. If you are updating an already tuned ECU then it is much more important to understand if any of the new features or fixes will affect the tune. Usually, important changes that may affect the tune are highlighted orange in the release notes. The base map will be updated at the same time. Would be nice not to have to download the software to see them.